I’m a big fan of Teeling’s work. Every whiskey they have released has been tasty, fun and enjoyable stuff. I’ve been looking forward to their official 15 year old release for a while now and I’m finally lucky enough to give it a taste and a review. This release is limited to 10,000 bottles and is exclusively matured in ex-rum casks for the duration of the 15 years. On first sniff there is a sweet shop. Candy cigarettes. Candy floss. Crisp green Apples. Sugar in a hot pan quickly becoming caramelised. Fruit starts to come forward on subsequent sniffs, with a boiled sweet, Opel fruit juiciness. American hard gums even. Mixed tropical fruits, pineapple, orange and peach. Touches of toasted coconut in the background. With a little time in the glass the aromas get thicker, with some light oak and dunnage warehouse notes. Complex, sweet and mouthwatering. Sweet and assertive arrival, lots of sugars, and mixed fruits. The boiled sweets analogy really covers it, it’s like they are melted down and amplified in juiciness. A very definite essence of old fashioned cola cubes. The development continues into the sweeter elements and it becomes clear the rum influences are quite prominent, sweet, and luscious. With a little inhale of air some dusty aged oak comes through the fruit and brings a touch of sweet cinnamon spice. Almonds round off the development. A lovely varying, flavour evolving throughout the experience. A medium length finish. Fruity zinginess becomes more effervescent. With drier fruitiness and pencil shavings rounding off the experience. Quite dry in the finale. A few drops added. The sweet shop themes on the nose are slightly intensified with the added drop of water. There is also a slight air of floral added to the mix. The palate has less of the natural oils found in the undiluted, but the fruits are more juicy and take more control throughout the development. The finish has less of the dryness originally encountered and more fruit juices, with less effervescence. This is one that benefits significantly with a drop of water. It’s bloody lovely. A beautifully sweet and fruity number. Thoroughly sip-able, and very enjoyable. This is an easy drinker and perfect as a spring/summer dram. This is possibly too easy a drinker for the price tag attached to it. But it’s limited nature means it won’t be around forever, and for the Teeling fan it is a must buy. 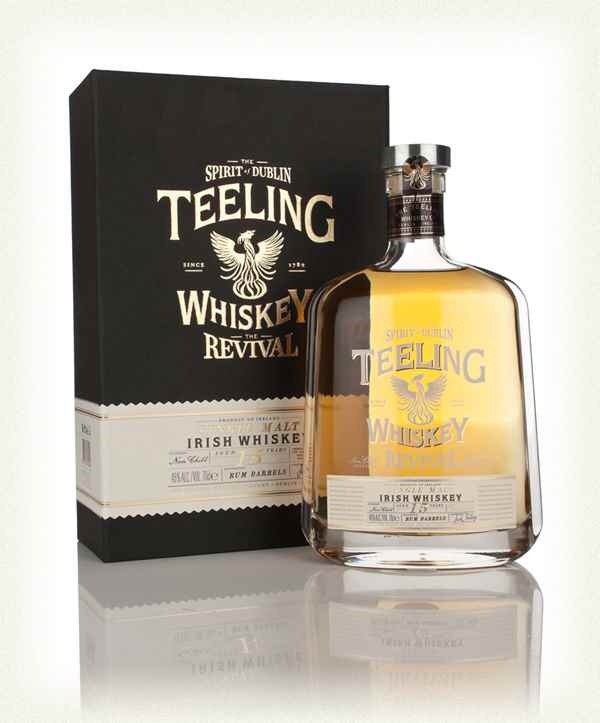 For me the Teeling 15 Revival sits slightly below the Teeling 21 Silver Reserve in their range, which I absolutely adore. The latest in Glenmorangie’s private edition range. 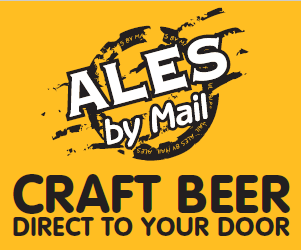 A limited edition release, bottled at 46% with no chill filtration. 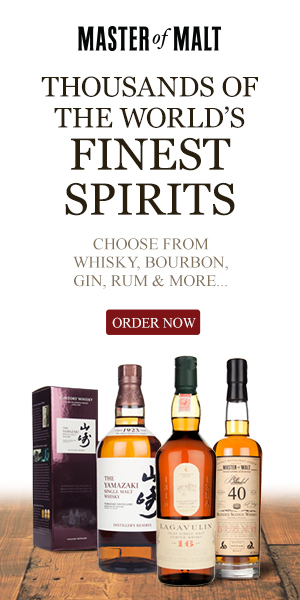 The whiskies in this range have pretty much all had no age statement, and been finished in a range of different casks. On this occasion this whisky has been finished in re-toasted Portuguese wine casks. I’m intrigued, I really liked Companta a few years back and that had quite a bit of red wine influence. Some like this style, some do not. Any which way, I can’t wait to check it out. On first pour the nose is quite light, creamy, buttery, with a backing of red berries, cherry and some pipe tobacco. After a few minutes in the glass the intensity of the fruit increases. New spicy aromas come forward now, some hot cinnamon, pepper and ginger. The toasted oak makes itself known with some oak char. The dark fruits are dried in nature with some raisin amongst dry cherry, red berries and raspberry. It’s a lovely concoction akin to an alternative fruitcake. Arrival is very fruity, long and intense, with a cherry led fruit basket, containing those previously encountered red berries from the nose. The development is slow and very interesting as things turn buttery with creamy intense vanilla taking the lead, almost bourbon like. The mouthfeel enhances this experience and is lovely and tongue coating. Spices enliven things with a cinnamon frosting like coating on the palate. Then fruit returns again, quite juicy and fresh. This is an exciting experience of a whisky. Lovely fruit juices and flesh continue through the long finish, with the warm buttery spices transcending into the chest giving a lovely feel good factor to this dram. I really like this undiluted, so I’m going to go careful adding only a few drops. There is more vanilla on the diluted nose, with some of the spices dialled back a notch or two. The palate has a juicier fruit lead from the arrival into development, somewhat more integrated, with the vanilla not as prominent when diluted. There is a new found chewy Danish pastry note into the development continuing into the finish which is just as long and warming, but slightly less in the spicy department. Hmmmmm. I would probably stick with the undiluted in the future with this dram, but I can understand how others may like to soften things down a little. I would go careful with water though. Bloody hell, I’m quite surprised by this. It’s not as winey as I was expecting and really has a lot of variation throughout the experience. It really is delicious stuff, very different and quite frankly I really enjoy these differences. I’m not sure how traditionalists would take on it, but this is a successful maturation in my opinion and I’m loving it. 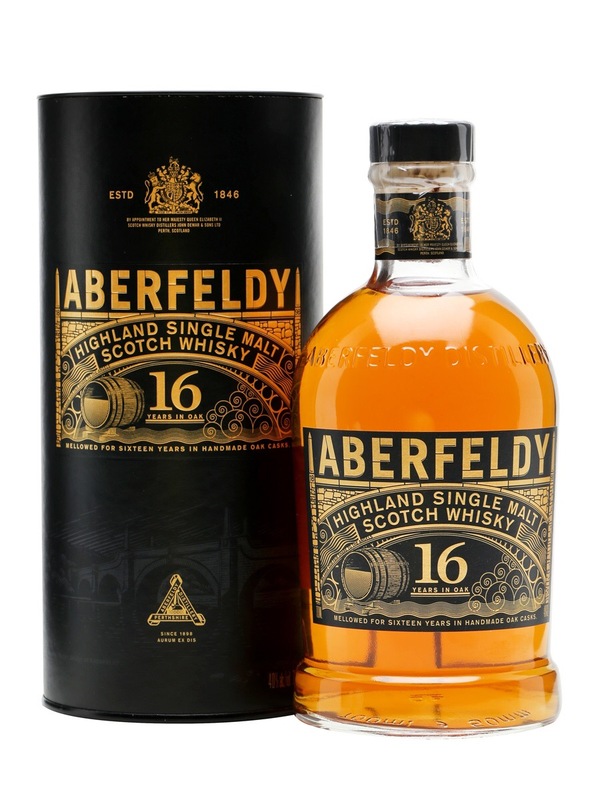 Aberfeldy 16 is the latest release in the line up from this “last great malts” distillery, joining alongside the 12, 18 & 21. On first sniff there is a plethora of Lemon juice, candy cigarettes, lemon sherberts, icing sugar, and lots of lovely sweet shop aromas. After a small amount of time resting the citrus notes dissipate to bring forward more oak assertion. There is more of a light, warm honey nature manifesting now, with the sweet shops settling into the background. Touches of candy floss pop forward randomly. Toffee and malt biscuits are now the forefront of the nose, with some dusty warehouse lingering in the depths. With a fair amount of time in the glass and a touch of warming the glass in the hand (it’s got a bit cold!) more nutty not s come forward and a light touch of Christmas spices. The sherry finish of this dram is very apparent in the arrival, familiar Christmas cake, clove, cherry fruits, rum and raisin all fly forward. The mouthfeel is quite light (it is a chill filtered 40% whisky after all). The development moves into rich honey and more of the same sherried lush experience. The whole experience is very smooth, with little burn. 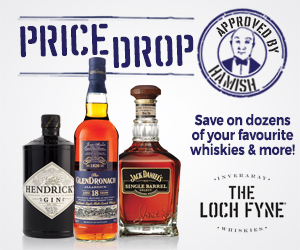 More toffee and juicy dark fruits continue to evolve as the whisky remains in the glass. Fruits fade quite quickly, but the medium length finish then turns back towards the nuttily familiar oloroso sherry, becoming drier and nutty, lip smacking and moreish. The warmth is experienced in the chest and gives a lovely feel good factor on a chilly night such as it is at the time of writing. Personally do not think whisky will assist this whisky, it seems rightly balanced as is. But I’ll risk spoiling the remainder of my dram for the sake of record. The complexity on the nose has been limited to dusty lemon citrus, with the richness having taken the hit from the water. The palate has been broken in the arrival loosing much of the flavour. Development goes into the same lemon and citrus land, but no longer rich and more watered down lockets. Sorry. This one and water does not mix. Keep it quality, keep it neat! A lovely, relaxing, flavourful whisky. I can imagine many a chilly winters night say in front of a touring fire sipping on this honey led beauty. No water though, it kills it quick. 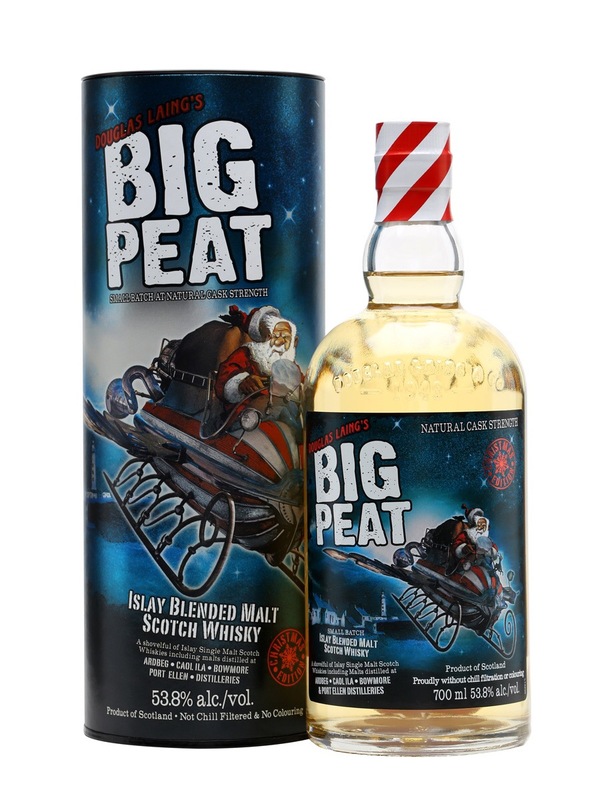 There are many traditions in the holiday season, like being late for many appointments, and my review of Big Peat Christmas Edition 2015 is no exception. I’ve not been very well (aaaaahhhhh – no that’s ok, no sympathy required) for a while with colds, Christmas, work and everyone else getting in the way of my fun reviewing whisky. So, it’s good to be back, and to review this yearly release of Big Peat presented at cask strength, non-chill filtered and colour free. Come on! 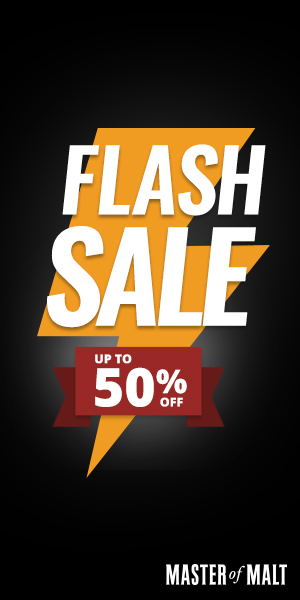 Let’s get it on, and this is still available should you want to (and why wouldn’t you?) grab a bottle. First sniff is sweet, thick sugars, syrup, sweet cinema popcorn, earthy. Then….meat…BBQ. The smoke starts bellowing up, some medicinal TCP laden hospital bandages. Bubbling bacon fat, pork scratchings, bacon jelly beans (sorry – just had some at work today and they reminded me of Islay! ), and this is just first sniff! There’s some young stuff in here, but Islay whiskies don’t have to be old, if you want peat (and this is BIG Peat), then it needs to be young, vibrant and have loads of smokey goodness going on, and this is full of it. Ok, 5 mins gone and now we have more maritime, iodine, sea air and salt, shellfish, scallops, the instal sweetness has now gone to the background and all this other bounty of aromas are swimming around in the front. It’s lovely, lovely stuff. Totally reminiscing over Islay now. 15 mins in the glass and everything is becoming nicely integrated, everything mentioned is well formed together and brings such a delicious smelling experience. Beautifully sweet arrival, sugar syrup, toffee pennies, some blackcurrant jam, quite spirit driven (not a bad thing though) then a muffled bang of alcohol heat, but it’s very gentle, not as I was expecting, refined, delicious. The delivery moves on and waves of those beautiful Islay signature flavours, juicy shellfish, soft barley stew complete with the meatiness, the remnants of a long burnt cigar. 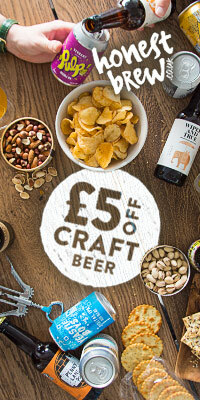 Utterly mouthwatering. Touches of sea salt on gammon steaks. Of course the smoke is back washing through the nasal passages and giving a great menthol cigarette note. Loooong finish, lots of Islay welcoming hugs of warmth and peaty splendour. Touches of bracken fruits remain through the smoke and earthy leftovers. I am utterly surprised at how great this is at cask strength I really don’t want to add water. Oh well. Just a few drops. The diluted nose really hasn’t changed an awful lot, it’s possibly slightly sweeter, but otherwise still full of all the previously experienced joy. The palate is more of a balanced experience, the ABV burn is now not experienced, leaving a longer exposure through arrival and development. Again, I’m experiencing very little difference in the content, a slightly more bacon intense development and a slightly sweeter arrival, so the intensity is up a notch or two. The mouthfeel is slightly weakened, but still awesome, the finish has slightly less smoke. I personally prefer the stronger, undiluted experience, but I can see the favour in the more balanced palate.